Amazon A-GO-GO. What else can Amazon disrupt? It wasn’t enough that they figured out the world of grab and go, no strings attached, making it super convenient for – you guessed it – consumers. And, it wasn’t enough that they delivered the first products by drone (oh yes, you’ll love this feature when it’s -8 degrees or you’re knee-deep binge-watching Netflix.) 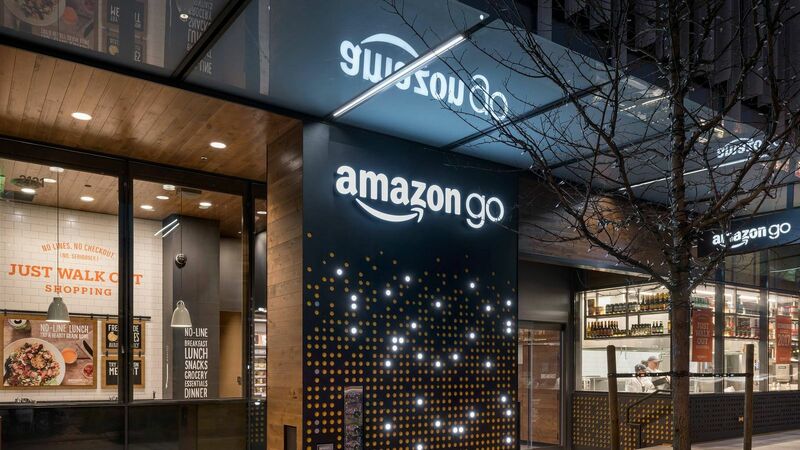 Now, they’re piloting completely automated ‘drive-through retail’ for grocery – think an actual robot army coordinating your grocery acquisition. But wait, there’s more disruption, as they are also adding alcohol to the mix for one-stop shopping nirvana! (unfortunately, all of us Ontarians will likely never see that one happen). That said, can you see the theme here? Amazon tenaciously experiments, and they continue accumulating pieces in their masterful, monolithic menagerie – they use and pioneer predictive modeling (if you like this you must also like this); zero-click ordering (we know you don’t like to fill out the same form over and over); purchase history (we let you easily find the thing you ordered a year ago); warehouses (always within 20 miles of 45 percent of the buying population for instantaneous delivery); millions of product SKUs (so you can not only find what you’re looking for but bump into things you never knew you wanted); artificial intelligence (so your data can be crunched to build better and better algorithms); voice receptors (let Alexa remind you that you need chocolate-covered pretzels with that movie right now), and The Movie Biz (Amazon Studios bagged a Best Actor Oscar for Casey Affleck and Manchester by the Sea). All of these innovations together have made Amazon one of the world’s most trusted brands. So why is this important? Beyond that fact that Amazon is on track to be the first trillion dollar market cap company, Amazon shows us what actually being agile means. I know the excuses out there… we’re a big multi-headed company, we have many disparate lines of business, we have ingrained processes, we have a certain culture… and the quintessential fallback, we’re not Amazon! If you haven’t checked out the Amazon Go concept yet – here’s the YouTube video. Excellent post. I was checking continuously this weblog and I am impressed! Extremely helpful info specially the last part 🙂 I handle such information a lot. I used to be looking for this certain info for a long time. Thank you and good luck. I do not even know how I ended up right here, however I assumed this publish used to be great. I don’t know who you might be however definitely you are going to a famous blogger when you are not already. Cheers! Hi there very cool website!! Guy .. Excellent .. Superb .. I will bookmark your web site and take the feeds also? I am satisfied to search out numerous useful information right here in the put up, we need work out more techniques on this regard, thanks for sharing. . . . . .
A motivating discussion is worth comment. I do believe that you need to publish more about this subject matter, it might not be a taboo matter but typically people do not discuss such topics. To the next! Many thanks! !